No other state in India has ever been through such a rapid political transformation in a span of 14 months as in Delhi. 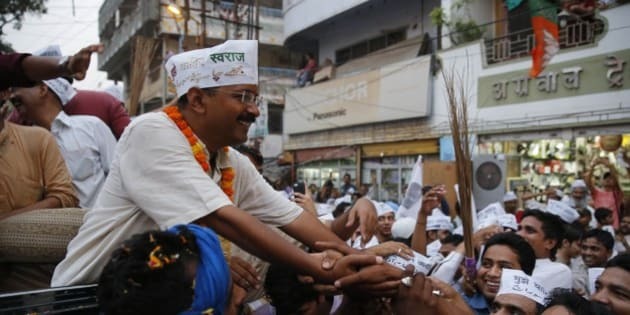 The political landscape of Delhi, dominated for decades by two national parties, saw the arrival a third political force–Aam Aadmi Party (AAP)–in the 2013 Assembly elections. AAP, the fledging political outfit, was the political outcome of the anti-corruption movement, led by Team Anna against the Congress-led UPA government, which had been hit by a series of scams. The national capital witnessed three elections in a span of 14 months; every election has thrown a different result. Not only have the election results been different in these battles of ballot, the social base or the vote base of political parties also got completely transformed. The 2015 Delhi Assembly elections have proved to be the point of historical departure in Indian politics. Whatever may be the results of Feb 7 elections, Delhi today stands critically polarized on socio-economic lines, or if we used Marxist terminology, one can say the populace of Delhi is mainly divided between the ‘haves’ and the ‘have-nots’. Conventionally, the term polarization in Indian politics in used in the context of religious or caste divide, especially in North India, where post Mandal, we saw the emergence of regional parties espousing the cause of particular castes, which eventually got cemented as their vote banks. In a historical departure, Delhi moved away from such polarizations and went to polls, when the electorate in the city appeared to be vertically divided on socio-economic lines. See here for a detailed demographic data on voting patters as per CVoter’s exit poll data. Nowhere in the past (except in those states where Left parties have been a dominant political force) has the elections been dominated by socio-economic issues. During Indira era, Congress too went to polls taking up ‘Gareebi Hatao’ slogan. However, lately, the electoral battles have been fought with the support of different vote banks, which had developed either on religious or caste lines. Delhi is a unique city; it is much more cosmopolitan than any other city of the country. It is an Indian microcosm. In the last 20 years, the entire demography of Delhi has changed. Post the liberalization of Indian economy in the early 90s, Delhi witnessed a booming economy and population influx from impoverished regions in search of better opportunities in the city. As a result, a huge Lower Income Group (LIG) and a significant Higher Income Group (HIG) developed in Delhi along with substantial Middle Income Group (MIG). Prior to opening of the Indian economy, Delhi was by and large a Punjabi city dominated by MIG. Till the 2013 assembly elections in Delhi, the socio-economic gulf in the city was not evident because of the leadership of Sheila Dikshit. During her regime as chief minister of Delhi for 15 years, Sheila’s leadership was synonymous with changing demography, while she remained a Punjabi for Delhiites, migrants from North Indian states identified with her as she was the daughter-in-law of Uma Shankar Dikhsit, former Congress leader from UP. Biggest plus point of Dikshit was that she maintained intact Congress’ core voters–Dalits, Muslims, LIG, while becoming the darling of Middle Classes. However, the 2013 Delhi Vidhan Sabha Elections heralded a tectonic shift in the political landscape of Delhi. A supposedly lightweight challenger went onto defeat a three-term chief minister in her home constituency and also took his party to power in a hung assembly. By doing this, Arvind Kejriwal had arrived on the national political scene. Although the election results threw up a hung assembly, dislodging Sheila from CM’s chair, the verdict was decisively against the incumbent Congress-led UPA government at the Centre. At the time of its launch, AAP was primarily an anti-corruption party. Congress became its main target as the party heading the coalition government at the Centre had been hit by a series of scams. Sheila lost because of UPA II facing charges of rampant corruption. However, despite its crushing defeat, Congress managed to secure 25 percent votes polled in the city. The vote composition of AAP and BJP was almost the same in 2013. The anti-Congress vote had got divided between these two parties. In 2013, AAP was much more about anti-incumbency and anti-corruption with its support coming mainly from the MIG. By 2015, it became more cosmopolitan. Making a spectacular political debut in 2013 Assembly elections, AAP formed the government and ruled the city for 49 days. Apart from vowing to root out rampant corruption, the party made major pro-poor populist announcement, which caught the imagination of those belonging to the lower strata of the society. In terms of its announcements and approach to implementing party’s policies, AAP’s model of governance appeared to be left leaning, espousing the cause of those on the margins of the society. After he decided to contest Lok Sabha elections from Varanasi against Narendra Modi, his image got changed from anti-Congress to anti-BJP. Thus, while his 49-day government was pro-poor, contesting elections against Modi helped Kejriwal in sending a message to the minority voters that he is ready to take on right-wing juggernaut, hence among Muslims he earned an image of being pro-minority. Muslims have always been voting against BJP, this time they polled in favour of AAP. In 2014 Lok Sabha elections, Dalits voted in large numbers in favour of BJP at the all-India level, which was the turning point, giving a clear mandate to the party. However, that didn’t happen in Delhi Assembly elections. It is a well-known fact that majority of Dalit population belongs to the LIG category. After his 49-day rule, Kejriwal emerged as the new messiah of the have-nots and garnered majority of their votes. Though the party lost 7 percent of MIG and HIG vote, which shifted to the BJP, the party gained 14 percent of LIG and minority votes from Congress (it was Dalits and minorities). It has robbed Congress of its core vote. AAP has triggered the polarization of haves towards the BJP. Now, there are two voters in this city–one hates Modi and the other hates Kejriwal. These elections were extremely polarized because of their governing models, economic policies and their manifestation in their speeches. Interestingly, Modi clicked to LIG people during Lok Sabha elections as long as he was a chaiwalla. However, the entry of Rs10 lakh rupee suit evaporated this branding and Kejriwal became the next chaiwala and the darling of LIG. Delhi getting polarized on socio-economic policies has more to do with the ideas of these two leaders. We have not seen such a transformation of a party in a span of a year and a half. This transformation is likely to yield success to Kejriwal in future as well. The AAP leader is likely to become more popular with his populist policies and freebies. However, such an economic agenda can clash with the free market economic policies that India has been adopting. Becoming Robin Hood is fine but this will anger those who are paying taxes and contributing to the economy. The friction will increase and the more electoral benefit due to these policies will further encourage Kejriwal to pursue this pro poor policies or the policies for have nots, leaving aside MIG and HIG. Five years from now Delhi will surely miss the inclusive policies of Sheila Dikshit.